revealed a kanji inscription for Sumi Terashima. George and Sumi Terashima lead the typical lives of Japanese residents of the White River Valley in the early days of the 20th Century. According to the 1930 Census, George M. Terashima came to the United States in 1911. He would have been just 14 years old that year, but we have no record indicating who might have met or accompanied him at such a tender age. In fact, George was fairly elusive in the early records. The only clue we have to his early life in America is in the form of a World War I draft registration card for a “John” Terashima of Orting, Pierce Co., Washington. John listed his year of birth as 1897 (same as George) and listed his father, who lived in Shiga-Ken, Japan (a common city of origin for the White River Valley Japanese) as his next of kin. It’s very possible that the younger Mr. Terashima could have gone by the name “John” before settling on “George” as his Americanized name. Sumi did not join George in this country until 1920—the year of their marriage. It is likely that she was one of the many “picture brides” who came to this country after exchanging snapshots with the man she would eventually marry. Those photos, along with the recommendation of the couple’s elders in Japan, served as the sparse foundation for many Japanese marriages. Nevertheless, the marriages arranged by this method usually endured until the death of one of the spouses. In addition to being practical, the method usually accomplished its goal of creating strong and stable families. By the time of the 1930 Census, George and Sumi were living in Aaron (Auburn), Washington, with their growing family. George worked as a laborer in a saw mill at that time. The couple went on to have at least three additional children after this census enumeration, including a son, Saburo Jack Terashima, who died in 1935 when he was just four months old. They buried him in the Auburn Pioneer Cemetery. Because George and Sumi were relatively recent and young arrivals (compared to many of their Issei neighbors), all of their surviving children were still living at home at the time of internment. In 1942, they and all of their eight children were sent first to Pinedale Assembly Center in California and then to Tule Lake Internment Camp. They were evidently later sent on to Minidoka Internment Camp in southern Idaho. We had been aware for some time that there is a Terashima grave marker (inscribed in Japanese) in the Auburn Pioneer Cemetery and had assumed that it was probably for Saburo Jack Terashima, the child who died in 1935 prior to the family's internment. We were therefore quite surprised when our translator identified this grave as specifically belonging to Sumi Terashima. Mrs. Terashima, the mother of the Terashima family, died on March 27, 1946 (not long after the closure on the internment camps) and is buried in Hillcrest Cemetery in Weiser, Idaho—not far from the Minidoka camp. 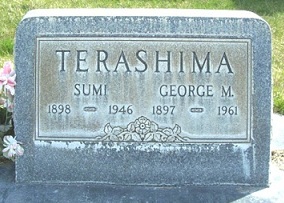 Who then, was the Sumi Terashima buried in Auburn? 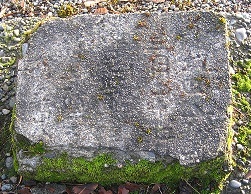 Our translator also provided the death date for the Sumi Terashima in Auburn: March 27, 1946—the same year indicated on the Idaho stone. Clearly, the two monuments commemorated the same individual. But why two stones for one person? Sumi. Photo by Cheryl Hanson; used with permission. When Sumi died in 1946, it is likely that her family sent her cremated remains to Auburn and arranged to have them buried in the Auburn cemetery where her baby Saburo was buried. The family, while still in Idaho, evidently arranged for a marker to be erected to commemorate Sumi too. It is entirely possible, even likely, that the family intended to return to Washington State once they got on their feet after internment. Unfortunately, as time passed, circumstances never allowed them to accomplish that relocation. They eventually established a family plot in the Weiser cemetery in Idaho. It was probably at the time of George’s death in 1961 that their children erected a stone there commemorating not only George, but Sumi was well. This would account for the fact that Mrs. Terashima would appear to be buried in two different cemeteries at the same time. A memorial marker erected for a person whose remains lie elsewhere is called a cenotaph. We know of at least one cenotaph in the Auburn cemetery for a couple who actually lived and died in Japan (Mr. Zenzaburo and Mrs. T. Natsuhara, parents of Chiyokichi Natsuhara) and of two cenotaphs in other cemeteries for people buried in the Auburn Pioneer Cemetery. Honoring ancestors is an important feature of the Buddhist religion, both in home alters kept for that purpose and in community cemeteries during Obon festivals. Not having local access to the graves of one’s ancestors can clearly be distressing for Buddhists who wish to formally honor their ancestors. This is the likely reason for the existence of the Japanese cenotaphs that we have discovered through our Auburn cemetery research. Although cenotaphs can bring great comfort to the family, they can also be confusing to genealogists and other historical researchers, as the Terashima situation illustrates.